Peanut Butter Buckeyes have been on my to-make list for like forever! But then a magical thought crossed my mind – could it be possible to make a Peanut Butter Buckeye even better with the addition of Oreos? You all went crazy with me over my Loaded Oreo Peanut Butter Bars a few weeks ago so I figured the answer must be YES! Lo and behold the Peanut Butter Oreo Buckeye was born. 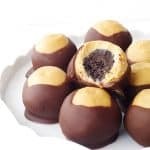 Creamy peanut butter buckeyes with a surprise Oreo cheesecake filling, all topped off with a dipping of dark chocolate – pure peanut butter bliss! How is your week going? Our house is being renovated at the moment so every day when I come home from work I feel like there is a fresh coating of dust over everything. On the plus side, when I make an absolute mess of the kitchen baking up a storm, I don’t feel as bad! So back to the topic at hand – did I mention these beauties are no bake? They are the perfect midweek pick me up. 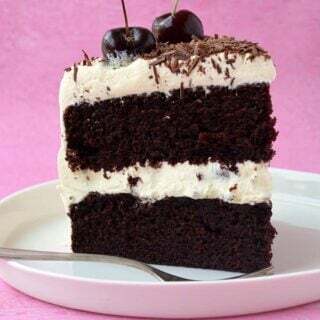 Oh, oh and you only need 6 ingredients! Have I convinced you yet? I have a stack of them sitting in my freezer, they are ridiculous good frozen, weird I know. This recipe basically only requires two skills, mixing and rolling. So first things first, crush those delicious Oreo biscuits – cream and all, before adding in cream cheese. Roll them into small balls and pop them into the fridge. Then its onto the filling, blitzing peanut butter, butter and icing sugar into a sweet paste. Cover each of the Oreo balls by rolling in your hands. Then it’s melting chocolate time! 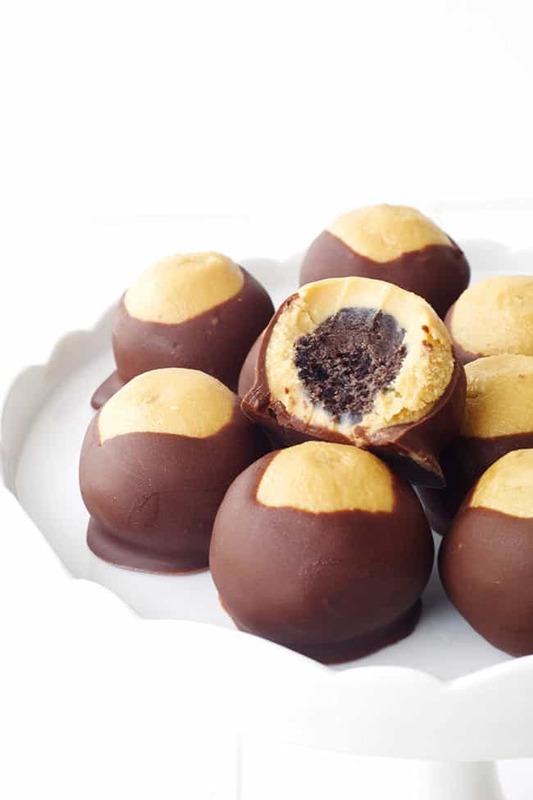 To achieve the traditional buckeye look, use a toothpick or skewer to dip each ball. Once they are set, it’s time to EAT! Or get them out of the house because they are so DARN delicious! 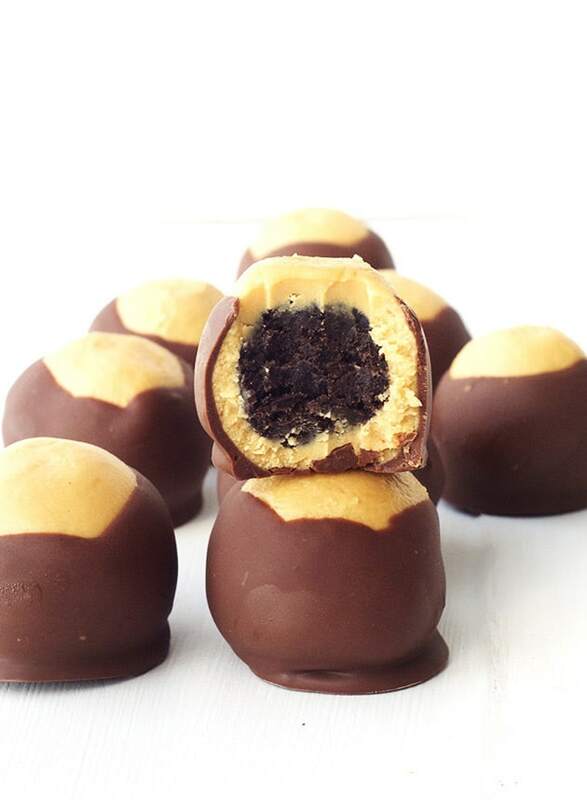 Creamy peanut butter buckeyes with a surprise Oreo cheesecake filling, dipped in dark chocolate. 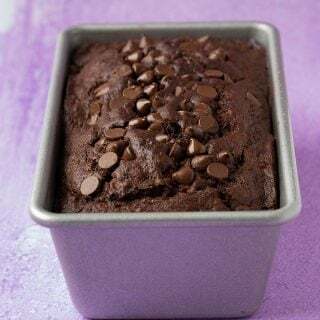 Begin by lining a large cookie sheet or baking tray with baking or parchment paper. Then pop all your Oreos (cream and all) into a food processor and whiz until they resemble fine crumbs. Then add in chunks of the softened cream cheese and whiz again. Stir with a plastic spatula or wooden spoon until the Oreo mixture is nice and wet. Roll the Oreo mixture into small balls and place onto your tray. You should make around 22 – 24 balls. Pop them into the fridge. Next to make the filling, add the peanut butter, butter and icing sugar into a large mixing bowl. Beat with an electric mixer on slow until combined and then turn the speed up to medium for about a minute or until the mixture is nice and smooth. Next, get your Oreo balls out of the fridge. Grab a piece of peanut butter and wrap it around the Oreo until there is no more Oreo showing. Roll into a smooth ball using your hands. Continue until all the balls are complete and refrigerate for at least 20 minutes until nice and firm. Place a small saucepan on medium heat with about 5cm or 2 inches of water in the bottom. Pop the dark chocolate into a small heatproof bowl and place the bowl on top of the saucepan, ensuring the bottom of the bowl will not touch the water below. Gently stir as the steam slowly melts the chocolate and it becomes silky and smooth. I liked to remove the chocolate from the heat but keep the bowl on top of the warm water to keep the chocolate nice and loose. Use a toothpick to dip each peanut butter ball into the chocolate before gently lifting it out and placing it back on the tray. Continue with all the truffles and then refrigerate for at least 30 minutes until the chocolate sets. Australian Oreos are slightly small than American Oreos, so it may be best to measure your amount of Oreos in grams, otherwise maybe just add 18 Oreo biscuits. I love this fun treat so much!!! Peanut butter and Oreo just goes together so well. A few years ago I made peanut butter cookie cups and stuffed them with Oreo truffles. Great minds think alike on good eats!!! Thanks Jocelyn! Oh wow, that sounds like a brilliant idea! 😉 Just love PB and Oreos! WOAH, Jess. You just made Buckeyes even better! Between these and Leah’s Reese’s peanut butter cup buckeyes, you both make my "regular" ones pale in comparison, hahaha. I say a virtual Buckeye party is in order! YUMMMMM! I didn’t know it was possible to make buckeyes better, but you’ve done it!! Seriously, I’m in love with the Oreos on the inside! YESSSS! Thanks so much Lindsay! I can NEVER say no to Oreos! i wish I could pass you one Ella! Hahaha love it! Thanks Suzanne! Oh my heck. You just made a Buckeye that I would devour. They look delicious! 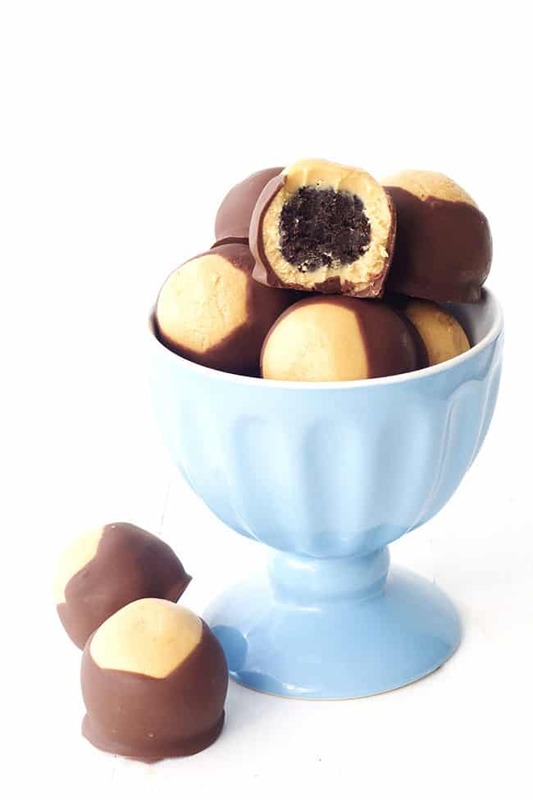 Oreo stuffed in peanut butter buckeyes is totally epic, Jess! Such a great idea and they look amazing! Hope your house reno gets finished soon – dust everywhere is never any fun. Yummy, I haven’t heard of buckeyes before but they look amaze! Totally genius!! 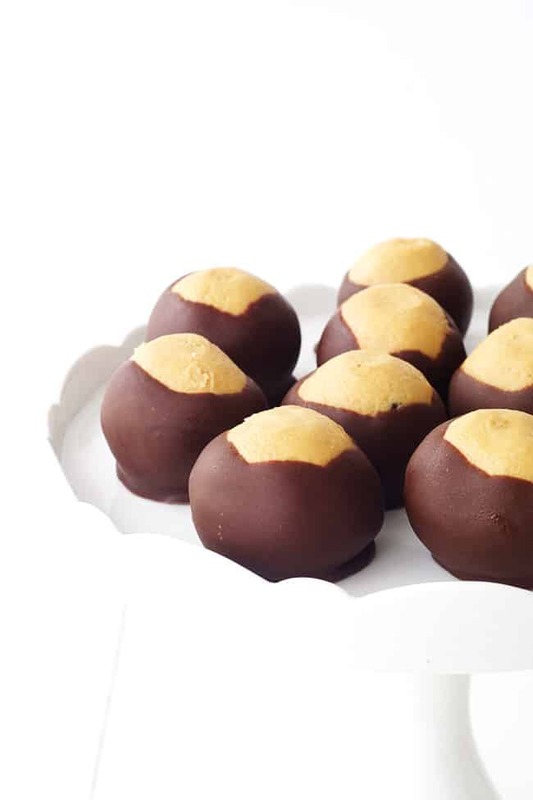 Buckeyes are a holiday tradition for us. Totally never thought to put oreo in the middle. We will be making these for Christmas! Oh I really hope you do get to make them Christin – you will LOVE them! Good luck with the house renos…I’m sure it will be worth it in the end 🙂 I love that these only require 2 easy skills! They look delicious, and I love that secret little Oreo surprise in the middle! Thanks Denise, they’re not even our renos – we’re just renting! 😉 Oh yes a little Oreo surprise always gets the thumbs up in my book! Every time I come here I think you’ve made pretty much the best thing ever. THESE are the best thing ever. I love the addition of Oreo! And I totally know what you mean about the dust — we built the house we live in now, and I always thought since we’d have a new house, it’d be clean. Oh my goodness, trying to get the dust out of every corner was a nightmare! Ashley, that is the sweetest comment – thank you! Yes that is SO true, I never thought about that with a new house! Good point! Ooh, I cant’ wait to see how your renovation turns out! These buckeyes are just incredible. I didn’t think a normal buckeye could get any better, but somehow you managed to do it – YUM!! I love Peanut Butter Buckeyes and love the addition of the Oreos! the perfect sweet treat! These look so delicious! I think I would goble them all up before I could take a photo of them! Hahaha thanks Shellie! Although it makes so many, I’m glad that didn’t happen! Yes! I love stashing treats in the freezer. It’s the best kind of surprise. 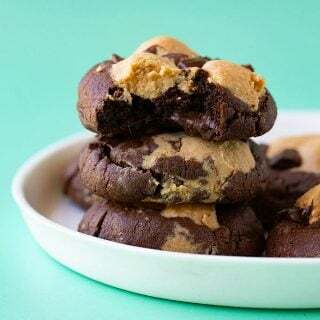 And these, frozen, would be just the best ‘home from the gym and need a sugar hit’ food or ‘curled up on the couch bingeing on Netflix’ food ever!